Dr Machungwa, a Cabinet minister in the Frederick Chiluba administration, yesterday said that there were no schools or colleges to train a person to be president of a country and that it made economic as well as management sense to re-elect Mr Lungu who would perform even better due to the experience he had gained on the job. He said that if citizens chose not to re-elect Mr Lungu back into office they risked wasting the economic and developmental projects achieved during his two-year tenure of office and would only do so if he had failed to deliver but looking at the numerous completed projects and programmes delivered he needed to be given a five-year term. Dr Machungwa said that changing a president every year would neither help the economy or management of the country and that Mr Lungu had performed well under the circumstances. “I wish to state that it makes economic and management sense that Zambians vote to retain President Lungu who has now been in office for one full year and some months. ‘‘My considered opinion is that he has performed extremely well under the circumstances and there is adequate evidence of this in the numerous completed projects and programmes,” he said. He said that the opposition had blamed President Lungu for ZESCO load shedding and the fall of copper prices which led to loss of jobs in the mining sector and adversely affected the economy but he wondered what the critics would have done to stop power outages in the absence of sufficient water in Lake Kariba and the free-fall of copper prices. “Removal of President Lungu from office at this election can only be considered if he has lamentably failed in the last 15 or so months. Of course, he has made some mistakes as part of the learning process; he is after all human. ‘‘But now there are those who are blaming him for ZESCO load shedding and last year’s collapse in world copper prices, events which have led to loss of jobs on the mines and adversely affected the economy. ‘‘The question, however, is, would those who are blaming him have stopped ZESCO load shedding in the absence of sufficient water in Lake Kariba or would they have stopped world copper prices from collapsing had they been in power? Clearly, the answer is ‘no’,” he said. 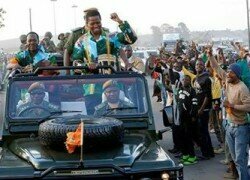 He urged Zambians to re-elect President Lungu to help save the economy and other resources of the country and expect even better and higher performance from him on account of the experience he had acquired while in office.